Puppy eating up a storm? Make sure the food is worth it! Feeding a puppy seems like a no-brainer, right? Just open a bag of food and feed him. That is, until you step into a pet store and find a hundred different brands of wet and dry food and your brain suddenly turns into mush. Finding the perfect food takes work. Feed only puppy food. Sounds too obvious? Some people with more than one dog might be tempted to feed all the dogs the same food. However, puppies need food especially designed for puppies. Puppy kibble is smaller in size and easier for young dogs to chew. 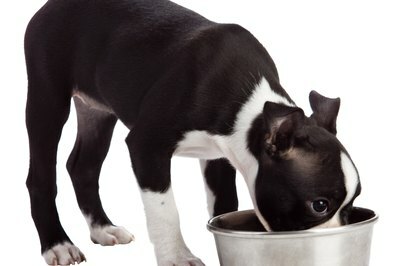 It's also easier to digest if you have a puppy who tends to swallow his food without even chewing it. Puppy food is higher in protein, which young pups need to develop and grow properly. Ask your vet if he has a recommendation. Sounds like the easy way out? It is, as long as you're ready to pay for premium puppy food. And yes, you should. Premium food contains all necessary nutrients to help the puppy grow healthier and stronger. Also, certain breeds—like large dogs—might do better on foods especially formulated for them. Decide whether you'll feed dry or canned food. Puppy not sporting teeth yet? 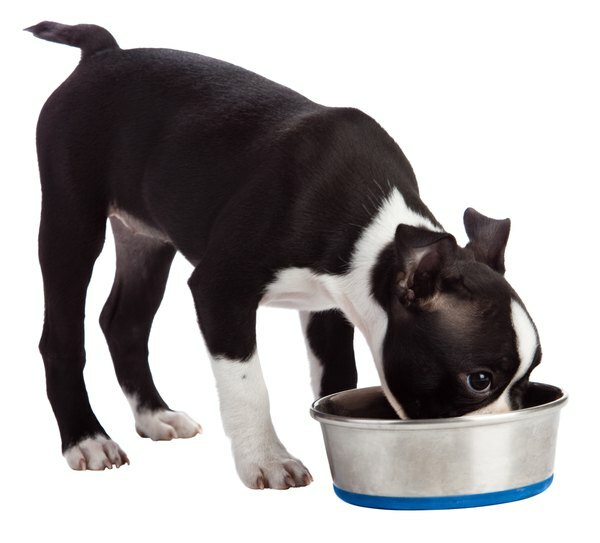 Canned food is best for very young puppies who cannot yet chew dry kibble. Once teeth make an appearance, "wet or dry" is a matter of preference. You can also choose to feed mostly dry food with a touch of canned food to add flavor or as a treat once in a while. Read the ingredient list when choosing puppy food. Stay away from anything with the word "byproduct" on the list of ingredients. Byproducts are all those things you would find extremely gross if they were listed by name, such as animal intestines and spleens, brains, feet and even hydrolyzed feathers. Look for the name of a meat—chicken, beef, liver—as the first ingredient in the list. Look for the words "Association of American Feed Control Officials approved" or something like "this foods meets the AAFCO nutritional requirements for puppies." This means the food you're buying contains all nutrients—vitamins, minerals and amino acids—growing puppies need to thrive. How Much Food Should a Puppy Be Given? Why Do Cats Ask for Food but Barely Eat It? Can Tetra Brand River Shrimp Sink?